Baizhang Huaihai (Chinese: 百丈懷海; pinyin: Bǎizhàng Huáihái; Wade-Giles: Pai-chang Huai-hai; Japanese: Hyakujo Ekai) (720-814) was a Chinese Zen master during the Tang Dynasty. 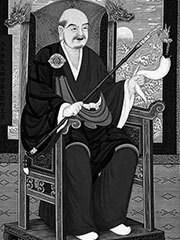 He was a dharma heir of Mazu Daoyi (Wade-Giles: Ma-tsu Tao-i). Baizhang’s students included: Huangbo and Lingyu. Baizhang stablished an early set of rules for Chan (Chinese Zen) monastic discipline, the Pure Rules of Huai Hai, which are used today in many Zen monasteries. Baizhang is remembered for the aphorism: «A day without work is a day without food.» His teachings and sayings have been translated by Thomas Cleary in Sayings and Doings of Pai-Chang (1978). Another book translated by John Blofeld in ‘ (1987) Buddhist Publishing Group, Totnes, has been erroneously attributed by some to Baizhang Huaihai, but was in fact a work by his dharma brother, Ta-chu Hui-hai Bách Trượng Hoài Hải.